Combine this with Quantumly entangled photons that you are beaming half to other places in the solar system while maintaining the other half locally where you can flip states all the way up until the signal is received and you have yourself a means of communicating in real time, even across light hours. I would assume this would be more useful for overcoming satellite lag in the short term but would quickly become the standard for all communications if it proved workable. Is this the same way a water wave 'impact front' can 'travel' at fantastic speed when two opposing wave fronts meet at a slight angle and the 'impact point 'travels' along the line of intersection from one end to the other? Or do they actually speed up the light pulse as they claimed? If so, they do not explain how they can do that in 'free space' (as opposed to media-transmitted contexts). No this is using the spooky action at a distance to change one half of an entangled pair that happens to be light hours away by changing the local half of that entanglement. At no point do any photons travel faster than light, but the end result is instant communication. It isn't my fault that quantum physics allows this seeming loophole. High-speed stock traders would pay for this just to get 2MS less lag. There are two aspects involved. One is the 'transmission' of quantum entanglement info, which already is purported to occur 'instantaneously' over said distance...so they cannot have 'speeded up' THAT at all. And then there is the alleged light pulse 'speed-up' mechanism which isn't explained....since the info is already supposed to be 'transmitted' instantaneously. So, can you explain how they can speed it up to 30 times lightspeed from an already supposed INSTANTANEOUS or INFINTE 'speed' at which quantum entanglement allegedly operates, mate? Thanks. No, I can't explain their methods. Assuming they are correct in their conclusions though, the speed of light is not limited by our assumed upper limit. My discussion was about slowing light down and storing it locally, which has been demonstrated numerous times in labs all around the world using various materials. I was looking at the double slit quantum eraser experiment and thought it might make a valid (but expensive) method of communicating over interplanetary distances. In real time (for strange definitions of real time). After all, Mars, for instance, does not share time with Earth (different gravity). I think that is a thing to do in the future though; not right now. *Sigh* this is group velocity. Not velocity of individual photons. It's like passing a laserpointer accross the face of the moon. Can the bright spot on the moon APPEAR to move faster than light? Yes. Does anything in this setup (including information transmission) move faster than light? No. Speed of light limits aren't broken, here. It's achieved with a (very clever) modulation of the beam characteristics with the magnetic and electric fields not at right angles to the direction of propagation but canted sharply forwards/aft. No this is using the spooky action at a distance to change one half of an entangled pair that happens to be light hours away by changing the local half of that entanglement. No. If you CHANGE one half of an entangled pair (i.e. set it to some value in an attempt to encode some message on it) this has no effect on the other one. In that moment you are breaking entaglement. Only when you MEASURE a (still) entangled entity do you know something about the other one. Correct me if I'm wrong, but observing an entangled photon breaks its entanglement, no? This is why we cannot use them to communicate. Correct me if I'm wrong, but observing an entangled photon breaks its entanglement, no? When you observe (i.e measure) then you get the knowledge about its state AND the state of the other entangled entity of the pair. Entanglement is broken to the degree of measurement, because you can do something funky like 'weak' measurement in which you only measure the state to a certain degree of probability. In this case entangelemnt is only partially broken (the correlation between the state of the entity and it's counterpart is weakened but not fully destroyed). And no, before anyone asks, you cannot use this for FTL information transmission either. *Sigh* this is group velocity. Yes, I was expecting to see either/both "phase velocity", "group velocity" somewhere in the article. "pulse" was the tip-off but I had to go to the original paper and look at the abstract. I recommened looking at the fourth animation down of the Wikipedia article "Phase Velocity". These seeming superluminal-like items hit the popular press over the past many decades on a semi-regular basis. This article is so bogus. I looked at multiple related articles, and saw things said like manipulating time and space. The only article I could find that eluded to a technical explanation said something about splitting up the light color spectrum, and made it sound like they redirected them at different angles through a lens of some sort. I wanted to add sarcasm in saying they reverse light with a mirror, which isn't reversal at all it is redirection, as is the explanation. Smoke and mirrors. This article must of originally come out on April Fool's Day and been reported a day or two late. This is only my opinion on the matter, but I've long suspected that the quantum entanglement attribute of the pair is a singular—non-local, atemporal—SHARED property, whether having the same or opposite sign, on measurement, of the respective local particles. This is a realist model, of course, and perhaps rather unparsimonious, if not downright silly. I just feel my freedom of thought allows me to choose which alternatives are LESS silly under the constraints of the baffling world of quantum phenomena. This article must of [have] originally come out on April Fool's Day and been reported a day or two late. No, the original, which is cited below the article, came out well before April Fool's, and the citation does include the title's phrase 'group velocities', where we smell the rat. 'Group velocity' is always a dead giveaway, and ought to be mentioned in a popular article, and elaborated on. But it has nothing to do with Fool's day. There have been dozens of related such articles over the decades. Well, yes. The point of entanglement is that the description of one of the pair is linked to the decription of the other one. i.e. they aren't completely separable. You have ONE attribute that describes both. Evidence of changing Einstein is in front of you and you refuse to see. What of the phrase about the Holocaust that none were so blind as those that refused to see......for if they actually loooked at the evidence of an ongoing Holocaust, then the responsibility to act would have been upon them. And THAT meant war, that which they could not bear to prepare for. That paralyzed France and other Europeans to not act. Similar here. New physics stares us now in the face. An unknown out of our comfort zone. Where the new fear is now there is no hard and fast rule. Now communication IS possible with lattice QCD research. Now can be seen why we get no interstellar commo from ordinary light/EM waves. Similar here. New physics stares us now in the face. Seriously. if you want to claim that something is a certain way then you need to start understanding what you're talking about. Otherwise you're just making yourself look like a doofus. Now communication IS possible with lattice QCD research. Erm whut? Lattice QCD has nothing to do with this (and nothing to do with long range information transmission at all). You are just stringing together random googled sciency sounding words. It's ridiculous. 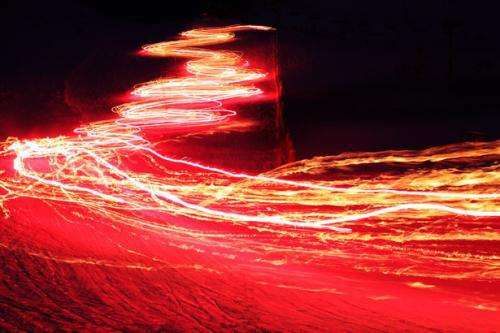 "Researchers develop way to control speed of light, send it backward"
"*Sigh* this is group velocity. Not velocity of individual photons." I sighed too when I read the title, Click baits and crackpots will always be with us, but in some areas they combine to the perfect storm of muddying the waters. Thx to you , danR and the rest for tidying up the area! Thx to ...and the rest for tidying up the area! You're welcome, mate! And I agree, these 'click bait' headings and deliberately misleading/sensational 'articles' by so-called 'science writers/journalists' etc are 'a pain in the ars-e' which contributes to much confused comments from those not alert to such 'publicity devices' to attract clicks rather than explain anything 'new' worth explaining. It was more a *sigh* towards the - oh so very predictable - slew of comments that misunderstood/misconstrued the content of the article rather than at the article itself (which I thought was quite clearly written). Even though the title is a bit click-baity I think a real "backwards-in-time" or "faster than light" type of story make a weeee bit bigger impact in the media.